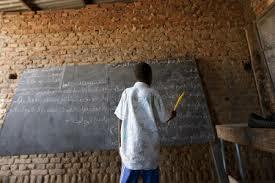 All the teachers of Angicakidde Primary School in Olololo Parish, Omoro Sub county in Alebtong on Monday took a “French Leave” leaving the pupils without any learning. The absence of the teachers including the headmaster Aluka Jaspher and his deputy Joseph Onweng and the unusual behaviors of the pupils attracted the attention of the School Management Committee and the PTA members who made an impromptu visit only to be shocked by their finding. Akullo Catherine, a member of the SMC said they are yet to find out why all the ten teachers did not report at their duty station while Opio Bonny, the Vice Chairperson PTA said they are experiencing a big problem of teacher absenteeism. He said despite the availability of teachers’ accommodation, most of them choose to commute from their homes or preferred places. Meanwhile, Ajal Samuel, one of the parents said the pupils say sometimes the learners from Primary four, five and six are combined under one classroom for lessons. One of the pupils who spoke to Radio Wa said most of the teachers abandon teaching on Friday and only return late on Monday or Tuesday. He said they also lack desks in classrooms.